Exercise can cause breathing disturbances like shallow breathing, particularly if you are overexerting yourself and training at a pace for which you are not yet conditioned. However, if you are engaging in light exercise or training at the lower end of your target heart rate range and still experience shallow or difficulty breathing, overexertion is likely not the only culprit. In addition, respiratory disorders, such as asthma and respiratory infections are associated with shallow breathing. Particularly if you have not exercised in some time, exerting yourself at a level of intensity that causes your heart to beat too fast can result in several symptoms, including shallow breathing. Before hopping on a treadmill or bike, calculate your target heart rate range, which is a guideline for appropriate exercise heart rates based on your age. This range is 50 to 85 percent of your maximum heart rate, which is your age subtracted from 220. For example, if you are 45 years old, your maximum heart rate is 175. 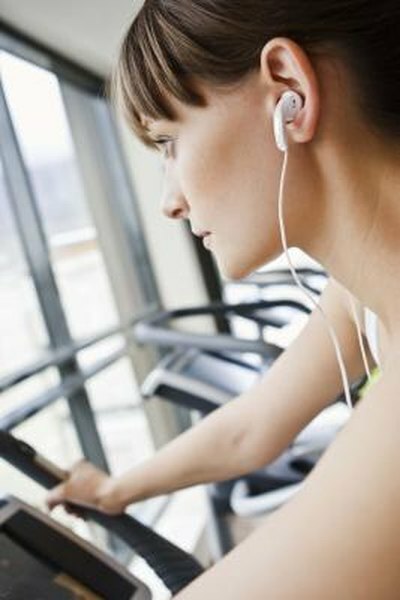 Therefore, your target heart rate range during exercise is 88 to 149 beats per minute. If you experience shallow breathing during exercise that is severe enough that you cannot regulate it without stopping your workout, you are overexerting yourself. If you are experiencing an illness, particularly one that affects the respiratory system, that illness can cause shallow breathing and hyperventilation during exercise. In addition to shortness of breath exacerbated by physical exertion, infections such as pneumonia can cause a cough, chills, headache, sweatiness, fever and chest pain. These manifestations are generally debilitating enough to limit physical activity. However, as is the case with walking pneumonia, symptoms may vary in number and degree, causing you to be unaware of the severity of the infection. Shallow breathing and shortness of breath, particularly upon exertion, may be your only indications. If you have these types of symptoms, and they are limiting your capacity to exercise, see your doctor. If you notice shallow breathing or difficulty breathing after several minutes of exertion, and you experience this in the absence of illness or overtraining, you may have exercise-induced asthma. This asthma typically occurs in asthmatics who are aware of their condition. Exercise-induced asthma, however, may warrant further intervention. Whether you have been diagnosed as having asthma or not, if you experience symptoms of exercise-induced asthma, especially after several attempts at physical activity, talk to your doctor. The condition should not limit your exercise tolerance if you manage it effectively. Chronic obstructive pulmonary disease, or COPD, is an illness that progresses slowly. It may be asymptomatic in its beginning phases. Breathing difficulties, including shallow breathing, can be one of the first signs of the disorder, especially if they become worse during even mild activity. Smoking is the primary cause of COPD. Other symptoms of the condition include wheezing, recurrent respiratory infections and a cough that produces mucus. If you are a current or past smoker, or you have been chronically exposed to secondhand smoke or hazardous chemicals where you work or live, do not ignore respiratory symptoms such as shallow breathing during exercise. They can be signs of a serious underlying illness.